ProQuest is enabling researchers to access a critical missing piece for understanding historic events with a first-ever complete, digital collection of Executive Orders and Presidential Proclamations. When complete, the collection will encompass more than 79,000 executive orders, proclamations, directives and policy statements by American presidents, from Washington to Obama, bringing together disparate content and making it easy to discover and work with. ProQuest Executive Orders and Presidential Proclamations is part of and can be searched along with ProQuest’s renowned and growing collection of U.S. government content, assembled within a technology architecture that improves research outcomes. Look at content samples for ProQuest Executive Orders and Presidential Proclamations here. 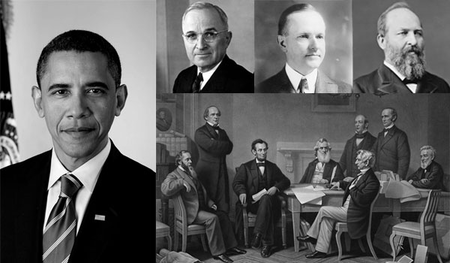 Holding the force of law, executive orders and proclamations have played a role in a range of historic events -- Native American removal, slave emancipation, internment of Japanese-Americans during World War II, desegregation of the military -– and provide important insight to presidential domestic and foreign policies. Until now, access to these documents by librarians and researchers has been challenging: many historic executive orders, especially those prior to 1935, are unnumbered, difficult to identify and locate online or elsewhere. To read the entire press release, click here. Bowker presents an infographic: "Presidents as Book Subjects"